This very select hosta variety is one of the best of the modern modern hostas, revered for both its beauty and performance in the garden. Stained Glass has improved substance, greater sun tolerance, and resistance to pests. 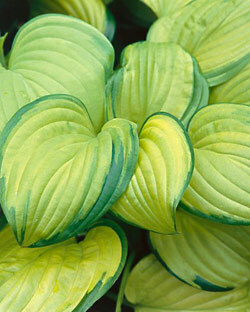 It is a wonderful presence in any planting with its huge gold leaves bordered with dark green margins. It is a very appealing plant with a wide and low habit. Superb as a groundcover, planted in mixed beds for subtle variations of color, and a natural in woodland settings.